The PTO really relies on the Acton Summer Camp Fair to supply a huge portion of the funds we need to pay for our Classroom Assistants (18 hours!) next year. Showing up at the camp fair lets the camps know we have the foot traffic to make it worth their while to come. They notice, and it is really important. Please drop by, especially with your middle school aged kids, it’ll help secure camp interest in our fair for future years. 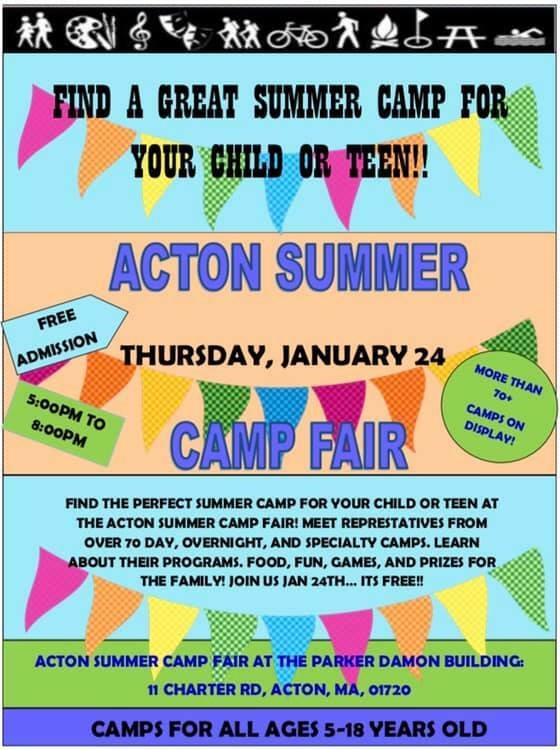 Acton Summer Camp Fair – Thursday January 24th from 5:00pm-8:00pm. Free Admission!! More than 70+camps on display! Find the perfect summer camp for your child or teen at the acton summer camp fair!! Meet representatives from over 70 day, overnight, and specialty camps. Learn about their programs. Food, fun, games, and prizes for the family!! Join us Jan 24th….it’s free!! Camps for 5-18 years old! Apprentice Camp Fair Registrations Coordinator – Help Wanted!